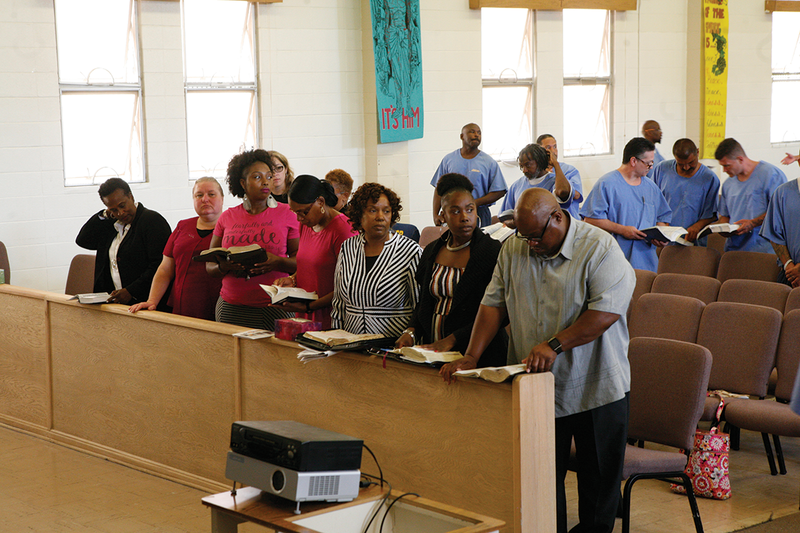 Eight incarcerated men stood before a number of women and prisoners to make amends for unethical behavior. They spoke at the second “Sister I’m Sorry” conference, hosted by Tony “Pup” Walldrip, at the Garden Chapel on August 11. The conference began with the screening of a “Sister I’m Sorry” event hosted by Margaret Avery, filmed and directed by Frank Underwood Jr.
Panel speakers were Bun Chanthon, Clay Harris, Larry “Doc” Histon, Andress Yancy, Darryl Hill, Darrell “Obediah” Flowers, Lonnie Morris, and Travis Lambert. Flowers, 47, serving a 12-to-life sentence, was given four minutes to speak about what he was sorry for. “I come from a drug-addicted mother who is a prostitute. She had me at 15 years old, and used to lie to me a lot. It made me angry, and at 14 years old I beat her up,” he said as he shed tears. “For being controlling, manipulative and a cheater, Sister, I’m sorry,” Flowers said. Her prediction came true, and he was sentenced to life in prison for murdering a man. “For not being there to give my wife her pain medication, abandoning my family, and for every sister who had a man like me, ‘Sister, I’m sorry,’” Hill said. Darlene Burke said she was moved by the fact that incarcerated men were holding a conference to apologize for mistreating women. Burke is the founder of Ten Toes In, a mentorship and domestic violence program, and she flew from Los Angeles to attend.